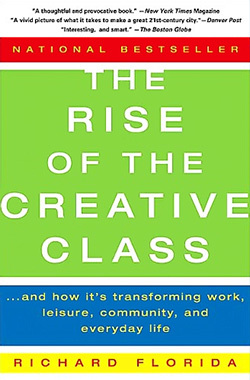 We continue our examination of the business book The Rise of the Creative Class with an interview of author Richard Florida. How did the book come about and where is the creative class congregating today? What was the impetus for you to write The Rise of the Creative Class? I’d been a professor and been interested in cities all my life. Since I was a little boy growing up in New Jersey, watching Newark decline. I saw the racial riots–they really troubled me. I was interested in why this city where my dad worked in a factory; the factory closed; the neighborhood we lived in went up in flames; there were tanks, armor vehicles on the street and the National Guard. I think that had a big impact on me. When I was looking at college I gravitated toward urban planning and cities. And I worked in this field as a pretty conventional urban planner: economic development, understanding why cities grow, looking at investment flows, business location decisions, the use of tax incentives to move companies. About this time I began to see a shift, not only in the landscape of business, but in what people want in their cities. I was talking to my students at Carnegie Mellon. And they kept telling me, “It’s not just that we’re picking a job; we’re picking a place to live.” It became clear to me that the whole field of economic development and urban planning had tilted away from reality. I was seeing these trends happening and I said, “I have to write this book.” What people want from a city and what is driving a city economy is very different than what I had learned. I wrote it because I was trying to talk honestly and candidly about these changes I was seeing in society, that people were telling me about, that I was seeing in the data. It didn’t seem like my field was really up to talking about it. I was surprised and what people told me afterward was, “I read the book and it sort of explained me and explained my city.” So I think it touched people in a very personal way–that’s very odd for me, because I am writing as an academic: looking at the trends, using data, and the book is dense, filled with tables and charts. People also resonated with it because it helped them explain, not only their own personal lives, but the challenges their cities were facing. What does it mean to be part of the creative class today? I really believe we have to put the word Class back on the table. I really believe the rise of a class that works with its mind and its creativity provides a lot of power to understand the social changes and social challenges we are going through. I offer this as a lens through which to not only view the potential growth of our economy, but the potential divide. And what really worries me is that the divides I pointed to in Rise of the Creative Class and the divides I pointed to as potentially occurring have become much more significant. And those divides are fundamentally class divides in our society–I wrote about them in subsequent books, such as Flight of the Creative Class. What I have said in my books–which has been my core message and the mission of my life–is to harness the creativity that lies deep within each human being. Progress will not happen without harnessing the third of us that work in the creative class: scientists, techies, artists, musicians, professionals, people working in medicine and education. I think as we grow, the cities that will become the most competitive and prosperous, the nations that become the most sustainable, will be the ones that finally look and see the creativity that lies within everyone. If we are going to solve the job problem we face, we are not going to solve it by putting more people in the creative class–that’s a third–we are not going to bring back manufacturing–that’s 10 to 20%. It’s the service jobs–45% of our workforce, 60+ million people working in routine service jobs like home health care aids, retail sales, food preparation–that we need to make better and turn into creative jobs. Where is the creative class congregating now? As economies develop you get a bigger division of labor, not only in industry, but in geography. It’s becoming more and more concentrated, but it has become so oppressively expensive to live in a place like London or New York or San Francisco. I said in the book, that if people in the great Midwest and Rust Belt cities, Pittsburgh and Cleveland and Buffalo, if the leadership would wake up and recognize the incredible asset they have of industrial architecture, this incredible place of authenticity and realism, that people would enjoy being there. They were leaving not because they didn’t like it, but because they couldn’t be themselves there. I think one of the things, and a lot of people don’t give me credit for this, one of the greatest things I have seen since I wrote Rise is the beginnings of the transformation in the Rust Belt. These cities are now recognizing the value of artists and culturally creative people, of embracing diversity, of embracing new immigrants, of embracing gay and lesbian communities. That’s what I saw happening in Chicago and Toronto. What really strikes me is the enormous success of college towns. When I wrote Rise you could see the rise of Austin, Texas. Consider the South by Southwest festival, what it is was then and what it is now. A couple of years later we could see in our data the rise of Boulder, Colorado and it’s now one of the leading places for startups. The place at the top of our metrics now is Ann Arbor, Michigan. Here’s a city that’s in the shadow of Detroit, which many people are saying is collapsing and decaying. It’s a large college town that has everything in common with Palo Alto, or Boulder, or Austin. We can add to the college town list Ithaca, New York or Madison, Wisconsin. The Rust Belt and the Sun Belt division no longer explains the patterns that we see. There are certain cities in the Frost Belt that are growing and others declining. In the Sun Belt there are probably more declining than growing. How has the writing process changed for you, from Rise to your recent book The Great Reset? I have gotten better–I hope the audience thinks that. For me writing Rise of the Creative Class was very, very hard. I had to write it three or four times. Because I didn’t start with a theme; I started with describing trends and changes I saw in society. Now I write more. Becoming a blogger and using social media has helped me. In the old days you wrote an occasional op-ed, an occasional academic paper, and you wrote a book. Now I write every day. I see myself more as a writer. I see my ability to write about new ideas. I tried to really emphasize those skills, to support my other skills like management and administration. Writing has become more efficient and easier. And maybe I am less scared of it. Before, it was hard to get my thoughts on the page. I think academic life kills good writing habits. It may be important for peer-reviewed journals, but it doesn’t translate readily into something an average person can understand. Before when I was writing a book, it was coming out as an academic text. So I had to translate it into this other language called “Real People.” Now it’s easier for me to switch between modes and write in a way that I hope conveys my ideas in a less stilted way. I have become more comfortable writing in a conversational style. Public speaking comes much easier for me and I’ve learned to try to write much more like how I speak and not be afraid of that. I don’t know. I think what makes any book a good book is that you need to have a subject that touches people in a conceptual way and in a heartfelt way; touches people’s minds, brains, and their souls. And no one knows what that is going to be in advance. I think you need a strong narrative. Most academics don’t understand that. And most business writers don’t understand that. A strong narrative is hard to get, unless you are Michael Lewis or Malcolm Gladwell. It’s really finding a construct that touches people’s heads and their hearts–but that’s true of any book. I didn’t think of Rise as a business book. I thought of it as a book with big concepts that had appeal to a broad group of people. And that’s what makes a good business book. The old idea of a business book only appealing to business men has broken down. I have so many favorite books, but there are three people that really influenced me. The first and most important is Jane Jacobs and her book The Economy of Cities, which I think everyone who works in business has to read. What the farm and agricultural land was for our first great American economy, what the industrial company was to the great Industrial age, what the Great American corporation was to our economy, the city is now the social and economic organizing unit of our time. If you want to understand how to be successful as a business, you have to understand not only your company, but your city that you live in. The second one is someone who equally influenced me is Peter Drucker. InPost-Capitalist Society Drucker brought together some of his best writings on the knowledge economy, the information economy, how to motivate knowledge workers. My work hopes to be a synthesis of Jacobs and Drucker. The third book is by the great sociologist Daniel Bell, called the The Coming of Post-Industrial Society. He had been a journalist and had become a professor and was chronicling the changes that he saw. He was one of the first people, like Drucker, to look at the rise of more knowledge-driven, more technocratic, more meritocratic capitalism. I think anyone who wants to understand the time we live in that those three are the most important to read. Business books have become more topical, more about puzzles and interesting questions. The business books I loved were the ones that looked at these big issues of economic and social development. I think that’s where my works tries to be. There aren’t a lot of us doing it anymore. People are doing more of a Freakonomics and a Tipping Point thing–and that’s phenomenal and people love it. But I see myself much more in the tradition of Jacobs, Bell, and Drucker–trying to understand the broad trends in the evolution of capitalism. 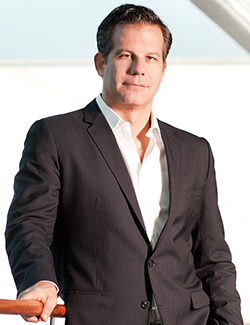 Richard Florida is the author of The Rise of the Creative Class… And How It’s Transforming Work, Leisure, Community and Everyday Life (Basic Books). Read more about The Rise of the Creative Class or our Leadership Hall of Fame.